OUCH! That has just got to hurt. See that's what I call a pal. A reliable Pal. Last C.C. I asked for more information on the bronze statue playing chess. goes to Alberta, Canada and takes these pictures. It is on Stephen Avenue, in Calgary, Alberta. It's called The Winner and was done by J.Seward Johnstone Jnr. Two days! This guy goes to a different country for Chandler Cornered. I ask you slobs for a game. One stinking lousy game. You do not even have to leave your own bedroom. You guys do not deserve me. huh! and bending those that have been taken. sculpture that had been the target of a crime. 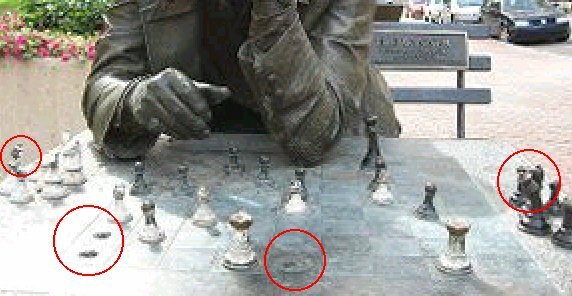 Chess Player that until recently was seated at a granite table in Vogel Plaza. That work was damaged last fall when two men from Klamath Falls tried to steal it. worth of damage," said Bev Power, park and recreation department spokesperson. put it back in Vogel Plaza." Pele's arms. Is nothing sacred? In Edinburgh there are two statues that used to get attacked. Greyfriars Bobby has twice had his head sawn off. wrong way around. It's now looking down Chambers Street. Originally it faced towards the graveyard. This is a picture I took last night of Bobby. The head is still there. I've blanked out the pub behind it because it has a naff jukebox. Esplanade outside Edinburgh Castle. It was always getting covered in red paint. Haig was in charge of the troops during WWI. A war I cannot understand. conclusion. Two inbred royal cousins had fallen out so millions died. I also came across a good and interesting chess site. Check this out and look at the Blogs. 'Juicy Plums Chess' is good (it's a chess site). Remember some C.C's ago. This problem with the two Knights. The study that Colin Bent thought was cooked. use from a set position. I want see if works. Well it appears to work. Let me know if anybody has any problems with it. And that is all you are getting. You are all fed up with me making merry of your losses. that new piece mover thingy. I'm using the same piece of java script. Here is one from Bratto where Jacob Aagaard, The current British Champion, played. Here are the final placings. The number after their position is the grading order. So top seed was Sergei Tiviakov. Another good result for Jacob. So now we see the top seed in action. just played 27...Qb6+ White played 28.Bb5?? (28.Kc1 holds). So Black did not take the Bishop with a check? No. He played 28...Rfc8?? and resigned after White's next move. Here is the full game. I've added the extra moves to show the mate. would have played 28...Qxb5+ Black's grade is 2451. He finished on 6pts. carry on and play by instinct. I guess Tiviakov was lucky eh?